This photo shows both a Shinto priest, or kannushi (神主) and a temple maiden or miko (巫女).1 While I am not a fashionista, what interests me about Shinto dress is how it has remained largely unchanged since the court aristocracy days of the Heian Period. The dress for men and woman still reflects the same dress that nobles and ladies of the Court would wear on a daily basis. So let’s take a closer look. The white robes, or ikan sokutai (衣冠束帯) were the ceremonial full dress of gentlemen in the Heian court. The white color here is seen as “pure” in keeping with Shinto’s emphasis on purity before approaching a kami. The black hat, or eboshi (烏帽子), likewise was the style worn by gentlemen, though adapted later to samurai in formal occasions and from there people in general. In his hands, the priest is holding a small wooden plank called shaku (笏), which is a kind of ‘scepter’ or ‘baton’ used by the Emperor or Shinto priests. Here you can see the purple trousers or hakama (袴). Normally in Japanese dress, hakama tends to be navy-blue or black, but apparently purple indicates a high-ranking priest at a shrine. The shoes are called asagutsu (浅靴), and date from the Edo Period (1600-1868). Also not shown, but frequently used on rainy days, are the Japanese-style parasols, or wagasa (和傘), which you can see pictures of on Google. Also, unlike the previous photo, the priest here is wearing a more elaborate headdress called a kanmuri (冠), also used by the old Heian Court nobility, and even today still used by the Imperial family during very formal occasions. Over time, the same headdress was adopted by samurai as well. Now, the woman’s ‘miko’ dress is generally the same. Miko tend to wear red hakama trousers, and white robes, again symbolizing purity in Shinto. Her hair is tied back, which to me is reminiscent of the Ladies of the Court, who in those days wore their hair down, and very long. That part may be a coincidence, I can’t confirm it. The role of Miko has definitely evolved over time, and does not appear to be as rigorous as it once was, but I believe vestiges from the Heian Court also survive in the present-day Miko. So, that’s a brief look at Shinto dress. I wish I had more information, or more sources, but I’ll update and add as I find them. P.S. Great job to Mrhayata for his excellent photo, and his willingness to share under the Creative Commons license. Thank you! 1 Temple maidens function as assistants to the priest whose usually male. The maidens also act as a kind of medium or shaman in some circumstances. 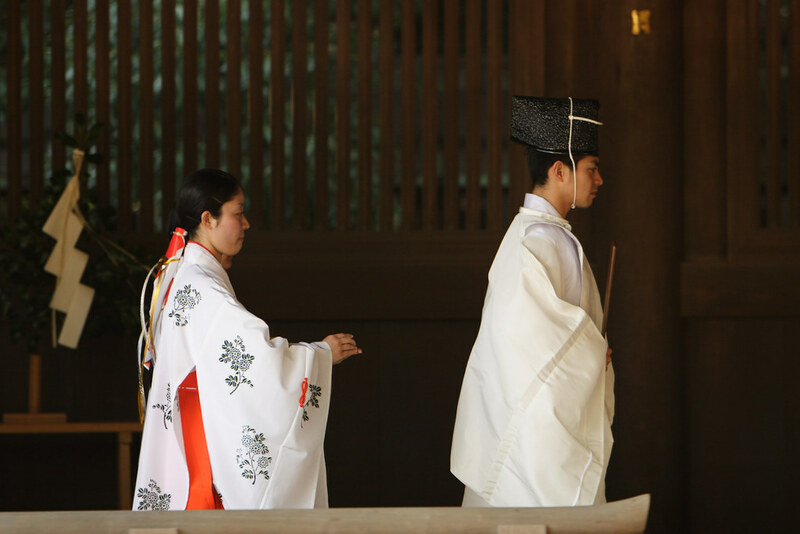 Since Shinto shrines are usually maintained within the same family, temple maidens may be daughters in training, or some other relation to the priest. In Diary of Lady Murasaki, the temple maiden at the Shrine of Kamo near the capitol was administered by a high-ranking Lady of the Court, who wielded the position with much influence along with her own retinue of maidens. The role of Shinto maidens should not be underestimated in history. The miko-san at my wedding, performed a dance to attract the attention of the kami-sama. They also were the ones who poured the sake needed for the ritual, gave me my vows written out, gave me the sacred offertory branch. etc. There were two priests, or maybe a priest and a deacon. The deacon (in blue) led the rites, the priest (in white) had a main blessing and gave a sermon but mostly just sat rigidly to one side. Also a picture of the deacon and the miko-san’s dance, the paper roll hair ornament is interesting. I too think it is amazing that they are essentially wearing the same attire that was worn by the aristocrats over a thousand years ago, including the interesting head piece. I like that women are so involved in the ceremonies. Traditionally, the shamans in Japan were women. Although they’re dying out, a few can still be found (or so I’ve read) in Tohoku. In Okinawa this practice is still alive (as well as in Korea). Oh, as an interesting aside, the kanji for eboshi 烏帽子 means literally “crow hat”! Robert: Great pictures! Much appreciated as it’s hard to get such things on the Internet and with the proper context too. Have you posted these on your blog yet? Seems fitting.